Hiking is a brilliant way to stay fit if you hate the gym, and provides the perfect escape from stress and the demands placed on us by work, family and friends. Wear the wrong type of footwear, however, and your life-affirming hike will turn into a blister-fest - unless you're kitted out with the best women’s hiking boots. You might be tempted to dash into your nearest outdoors shop and pick up the cheapest pair of waterproof boots you can find, but skimping on technical footwear only proves to be a false economy in the long run. Each of our featured women's hiking boots below are chosen not for their price (be it high or low), but because of how well they actively support and protect your feet on the trail. The best women’s hiking boots are waterproof, supportive and comfortable to wear, regardless of whether you’re embarking on a short day hike or venturing out for longer on a multi-day trek. They should also offer a superb fit – snug but never tight – and provide decent protection around your heels and toes. For those reasons, our current top pick is the Salomon Quest 4D 3 GTX Women's. These hiking boots are ideal for those of you who want to experience sheer comfort when hiking, and not have to worry about wet feet when crossing streams or trekking through slush. Salomon’s high-performance technical boots feature Gore-Tex for waterproofing and have a high degree of breathability, ensuring excess moisture is quickly wicked away from your feet. Uppers: this is the uppermost part of the boot that protects your foot. The best women’s hiking boots feature waterproof uppers, or at the very least water repellent ones, and they’re breathable too. This keeps sweat and other moisture to a minimum. Uppers come in a range of materials, from full-grain leather to synthetics such as polyester and nylon. Generally speaking, the heavier the material (like leather), the heavier the boot. The specific material used for uppers also has an impact on breathability and water resistance. Midsoles: these provide cushioning for your feet and determine the boot’s stiffness. When choosing women’s hiking boots for longer hikes over tougher terrain, stiffer boots can deliver enhanced comfort and stability. Common materials for midsoles include EVA, for improved cushioning, and polyurethane, for increased stiffness and durability. EVA is often found in entry-level women’s hiking boots, as it’s cheaper, with polyurethane finding its way into the more pro-level models. Outsoles: there to absorb and redirect shocks from the impact of your foot on the ground. Again, look through our women’s hiking boots list and you will see that rubber is a common material for outsoles. Other important factors when it comes to outsoles are the lug pattern – those little bumps on the sole that aid better traction (grip) – and the heel brake, there to reduce the chances of your slipping on the trail. Crampon connections: this is an important consideration to make if you’re planning on buying hiking boots for use during mountaineering or snow and ice-laden hiking. Why? Crampons are attached to the bottom of compatible boots to increase grip on ice and snow. Which type of boots do you need? 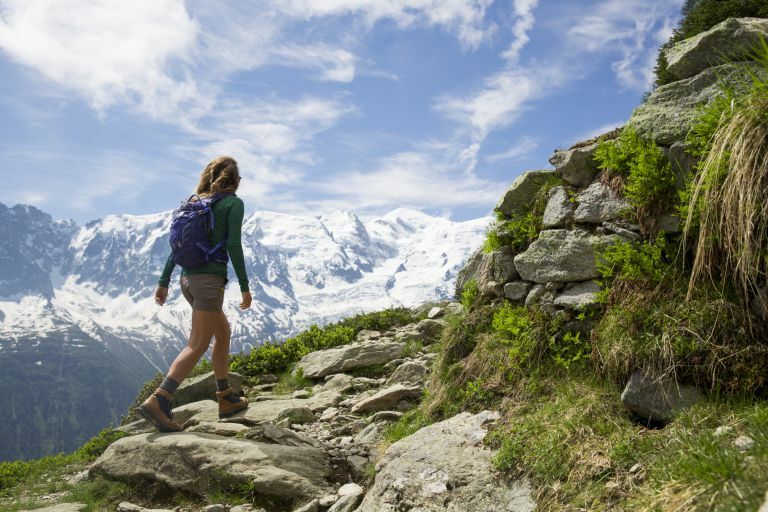 In this buyer’s guide to the best women’s hiking boots, we’re focusing on day hiking boots and backpacking hiking boots. If you’re looking for lightweight hiking footwear, you’ll find them and more in our best women's walking shoes guide. Day hiking boots are, as the name suggests, designed to boost your comfort and stability on day hikes or shorter backpacking trips where you aren’t carrying loads of extra gear. They come in mid- and high-cut models, and are intended for day hikes or short backpacking trips where you’ll be carrying lighter loads. Bonus: you’ll be able to break them in quicker. For longer hiking trips, where you’ll be carrying heavy loads in your backpack, backpacking hiking boots are necessary. These heavy duty technical boots offer supreme support on and above the ankle, with stiffer midsoles enhancing stability. Let's start with material. Durable and long-lasting, leather feels undeniably luxurious, but is generally harder to break in, and therein lies the rub—literally. Not so long ago, leather boots were generally more durable, while boots made with synthetic materials were lighter. Advances in technology mean there's now less difference between these boots, although models made with manmade materials are often harder to clean, and leather boots are generally less breathable. Leather boots will often last longer and tend to offer better protection from the elements. Speaking of which, Gore-Tex or ngx waterproof liners are brilliant at keeping feet dry. You’ll also want to ensure the fit is snug all over, without feeling tight. Check to ensure there’s enough wiggle room for your toes. The best time to try on boots is at the end of the day, once your feet are swollen and have reached their largest. This helps you avoid buying boots that are too small. These highly technical boots have a Gore-Tex Performance Comfort waterproof liner, making them safe to wear during the autumn and winter, as well as during the summer months when you might be walking across streams and brooks. Salomon’s Quest 4D 3 GTX offer a huge amount of support and comfort, yet aren’t as heavy as they might appear. We’re not saying they’re featherlight, but they won’t weigh your feet down either. These hiking boots for women also offer a superb fit, with an adjustable lacing system to give you a snug feel that enhances support in high-impact places: toes, heels, arch. The boots are infused with running shoe tech and sport an Advanced Chassis, there to increase the amount of cushioning and the level at which the boots absorb shock from impact (your feet repeatedly hitting the ground). This tech also works to reduce fatigue, helping you to hike comfortably for longer. Our top pick for the best women’s hiking boots is ideal for backpacking holidays, and for throwing on when you’re heading into the mountains for a day hike. Salomon’s High Traction Contagrip will ensure you stay upright and stable on various types of terrain, including ice and scree. The lightest hiking boot in this round-up, Inov-8’s hotly anticipated Roclite 335 trail boot is a pleasure to wear. Whether you’re hiking along a stone and leaf-strewn trail or ambling upon wet sand, these technical boots will help you stay upright. At only 335g you’ll hardly notice them on your feet. We wore them with light hiking socks and had zero issues with rubbing or blisters. In fact, despite wearing them for nine hours+ on the first day of testing, we experienced much less foot fatigue than with other more expensive, heavier hiking boots we’ve tried in the past. The Inov-8 Roclite 335 are flexible enough to accommodate any swelling in your feet too, which is good news towards the end of a long hike or walk. While they’re water-resistant, they’re not fully waterproof, so don’t submerge them completely in puddles or streams. Of course, the main attraction with Inov-8’s latest trail boots is the graphene-infused rubber grip, known as G-GRIP. Graphene is the strongest material on earth – 200 times stronger than steel yet only one atom thick – so you can imagine the technical prowess it lends to these boots. We maintained a steady balance on the frost and ice of late winter during initial testing, and felt continuously sure-footed thanks to the impressive grip and traction enabled by those G-GRIP soles. The PrimaLoft insulation adds extra warmth for cold weather hikes and walks too. Elsewhere, the boot cut design is comfortable around the ankle, offering ample padding without encouraging a build-up of sweat. PrimaLoft’s breathable properties comes into play again here, keeping clammy feet at bay. Ultimately, if you’re looking for a lightweight yet hard-wearing trail boot, and you don’t mind that they’re water-resistant instead of being fully waterproof (the Inov-8 Roclite 345 GTX boots are waterproof), then slip into these pronto. These excellent all-rounders are packed with features designed to keep you hiking all day, including shock absorbing EVA mid soles and Berghaus's extra-grippy OPTI-STUD technology. Rest assured,these boots will go the distance: the hard-wearing leather is made in a tannery certified by the Leather Working Group (which assesses the performance capabilities of leather products) and the upper has a scuff-resistant coating. These hiking boots for women will also keep your feet odour-free, thanks to the use of breathable mesh panels in key areas. Turn your favourite hiking trail into a catwalk with these beauties, the latest offerings from Merrell. An upper made from both nubuck leather and mesh creates the perfect balance between durability and style. The air-cushioned sole enables you to hike the toughest of trails for hours on end without suffering unwanted aches and pains. A fantastic year-round option, proving that the toughest of boots don't have to weigh a tonne (or cost the earth). For serious walking, you’re going to want some serious support. That’s where the Scarpa Peak Gore-tex Boot comes in. This boot has been praised for its durability, standing up to even inclement weather, and, hitting a little higher than most boots, it's great for secure and supported ankles. Although pricey, this boot is a great investment for all year round, and comes in an appealing teal shade that’s at once feminine and understated. This stylish women’s hiking boot is beyond good-looking — it’s also the best boot for wet weather. Owners of the Keen Terradora Waterproof Boot have been known to wax lyrical about just how waterproof it is, so there’s no need to fret at an unexpected stream (unless it means you’re really, really lost). The adaptable soft mesh material is ideal if you don’t have time to devote to breaking in, and looks the part no matter which shade you choose. A great investment, but not the best for very small feet. Durable, comfortable, and reliable, it’s unsurprising that Lowa’s walking boots are some of Europe’s best-sellers. Their trusty Vibram soles wear extremely well, so you’ll be sure to get years of walking out of them, and the interiors have been praised for their comfort, resulting in dry feet even after a long day’s walk. These have a narrower fit, good news for walkers with smaller feet, but may still require some breaking in thanks to their nubuck construction. You may be thinking that buying boots on a budget is a one-way ticket to painful blisters — but we don’t mind telling you that you’d be wrong. The Karrimor Ladies Hot Rock Waterproof boots have been praised for their balance of comfort and durability, especially at their budget price. They have thick soles for exploring rough terrain, and a soft outer for easy movement with no rubbing. If you’re after years of faithful service, this isn’t the one. But for semi-regular walking, it’s a winner. With solid toe coverage and contoured soles, these North Face hiking boots are guaranteed to keep you comfy, buoyant, and warm all the way along the trail, even if it’s particularly rocky. They have a slightly lower ankle than many other boots, allowing for more movement on inclines, but still provide admirable support. These might be some of the toughest on the market, but their cheerful magenta accents keep them looking sweet. If you’re looking for an everyday boot for everyday use, one that looks the part but won’t break the bank, you’ve found it. Presenting Hi Gear’s Snowden Waterproof Boots: these are almost identical to the boots Kate Middleton wore on her trip to Borneo, but half the price — a royally good bargain, if you ask us. Made from full-grain leather in classic brown, they have an unbeatable heritage look, and while they don’t have Gore-tex technology, they are fully waterproof. For the price, they certainly do a good job. There are plenty of good hiking boots for women, but few that truly excel in all areas that matter: comfort, waterproofing, support, stability and style. The Salomon Quest 4D 3 GTX Women's continues to impress us, and should be top of your list to check out for multi-season hiking. We also recommend the Inov-8 Roclite 335 trail boots, designed with a G-GRIP graphene infused rubber grip to deliver immense grip and traction. They're incredibly lightweight too, and flexible enough to accommodate swollen feet when you're out on the trail. Claire Davies is Senior Content Editor at T3 and routinely tests hiking and walking gear, and camping tech, for the Outdoors channel. Tamara Hinson is a travel and outdoors journalist who regularly enjoys hiking and walking, among other outdoor pursuits.